Mobile C-arms are used in operating theaters (OT) across the world. Regardless of brand or model, effectiveness is often dependent on the radiographer controlling the machine. 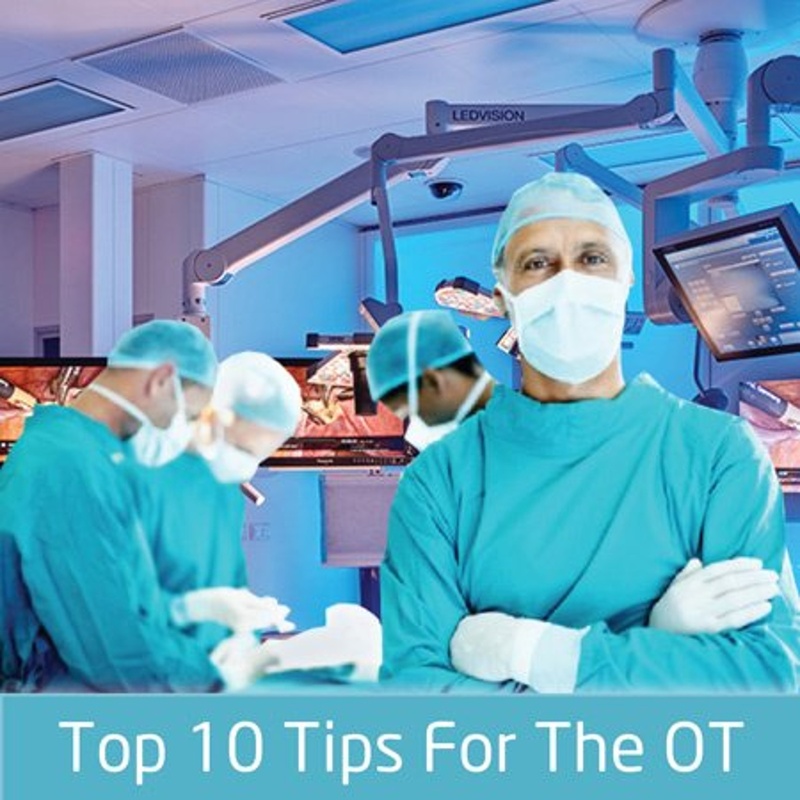 That’s why we’ve assembled these tips that focus on both using your C-Arm as well as best practices in the operating theater. 1. Get to know the surgeon, the different procedures and the image intensifier. This sounds straight forward but it’s an essential part of using a C-Arm in the OT. Every surgeon has their own process, getting to know how they perform a procedure, what they need at certain times and where you should be insures smooth communication and improves outcomes. When you fully understand how the C-Arm image intensifier works, including all of the settings and positions necessary during the procedure, it can speed up the surgery while making you look more professional and prepared at the same time. It’s a winning combination for the surgeon, the patient and your career. If you are working with a new surgeon or in a procedure you haven’t done before, talk to the surgeon or another radiographer who has performed the procedure beforehand and ask specific questions about C-Arm position and the necessary imaging settings. 2. Get setup for success. Preparing the little things before a surgical procedure can save you time and energy. Make sure to cover or drape your image intensifier using a sterile bag or cover. For all the other pieces of the C-arm that will get near the operating area, cover them with a sterile or non-sterile (depending on what OT rules dictate) sheet or bag. The five minutes it takes to put these covers in place will prevent any messy cleanup when everything is finished. And don’t forget to secure your plug. By fastening the main cord to the boom with a self-tightening safety knot you prevent any chance of outage as well as damage to the C-Arm if someone were to trip on it. In addition, connecting your power supply to the plug bank allows you to quickly identify which plug is yours when it’s time to cleanup. 3. Make sure you can see the monitors and access the control panel easily. Another seemingly obvious tip that can get overlooked during setup. Before you begin, make sure to face the monitor cart panel towards the spot where you will be standing. This small time saving effort provides you with easy access to the control panel if you need to manipulate the image. Not all image intensifiers will have this issue, but it’s important to remember for when you’re working on a C-Arm with a separate monitor cart. 4. Confirm your storage space. When you’re using an image intensifier with a hard drive, make sure to check the remaining hard-drive space before starting a new procedure. You don’t want to have to stop a procedure to free up space. Obviously if you’re using a non-digital system this won’t be an issue. 5. Double check the details and make sure the surgeon is operating on the correct side. Earlier in this blog, we suggested that you become familiar with the different procedures that require the use of a C-Arm in the operating theater. It’s also a good idea to periodically double-check the specific details of a procedure. It’s not only a good way to stay up to date with the procedure and stay prepared, but it also insures your surgeon is operating on the correct side. Believe it or not, accidents like this do happen. Double-checking can save the day and make you an invaluable member of any surgical team. 6. Watch the surgeon’s eyes when screening. One of the radiographer’s jobs is to minimize a patient’s exposure to radiation. By watching the surgeon’s eyes during the procedure, a radiographer can minimize the fluoroscopy time that the surgeon needs for the procedure. 7. Consider using a sequence acquisition when appropriate. In addition to video, modern mobile image intensifiers can store images as a sequence almost like a .gif file. This recording method enables the radiographer to record dynamic information that can be useful in a variety of procedures. It facilitates quick playback where small details can be examined more closely and the sequence can be looped for repeated examination. 8. Carefully move the C-Arm and don’t clean the image intensifier during open surgery. It goes without saying but we’re going to say it anyway. The operating theater needs to be a highly controlled clean room where everything is organized and sterile. During a C-Arm procedure, when it is necessary to move the C-arm, go slowly and make sure there’s proper clearance. Also, make sure to ask others for feedback to make sure nothing is accidently bumped. While the machine and room should be clean, any dust or cleaning solution could have catastrophic repercussions if they were to come in contact with a patient during surgery. 9. Use equipotential earthing for cardiac cases. Redundancy is often important when lives are on the line. This is why the image intensifier on your C-Arm has a separate earth lead. Use it to avoid static discharge during surgery. 10. Remember the basic principles of radiography. Finally, it’s always important to remember the big three of radiology, distance, shielding and time. In the operating theater, there will always be moments where you can utilize your knowledge of radiology in new or different ways. Consider the procedure and the desired results and manipulate the C-Arm to provide the surgeon with the best possible image and the patient with the least amount of exposure to radiation. Remember what areas are shielded and modify your techniques based on the radiation scatter cloud and where people are standing. If you need any information on C-Arms you can always talk to the experts here at Atlantis Worldwide. A refurbished or used C-Arm will give you the performance you need, at a price that makes a lot more sense. At Atlantis Worldwide, we can help you determine which C-Arm would be best for your budget, goals and demands. Contact us today!